We continuing to some features of media players that would many people don't know.in previous we discusses the ability of vlc to use it as a video cutting tool.Today we are going to show the ability of QQ-player as a video converter. QQ-player is now the widely used player and every one is know about it but most of people don't know about it's features. they are using this player just to play the music or any of his media file.every media player has their own features, And the QQ-player is one of them and having so cute and helpful features. So today we decided to discuss one of its best feature that you may not know about it. QQ-player has the ability that it can convert one media file format to other. i.e you can convert any media file from wmv.mkv.avi. to your choice i.e 3gp. mp4 etc. Many people use some heavy converters just for converting his media file from one format to other like tvc or avc or any other. but for this you have to pay amount.or if you have free version then it will take size on your disk and will sure to slow your pc speed. Anyways there i will teach you to get rid of these things.You will just to use your favorite player(QQ-player). So to convert your video follow this simple steps given below. Step-1: First of all launch QQ-player, and play your video you want to convert. Step-2: Now click on the toolbox button "you can see at the right side of the bottom"As given in below picture.In the toolbox you have to click on "trans" option. Step-3: After clicking on trans you will see a new box on your screen(like this one). 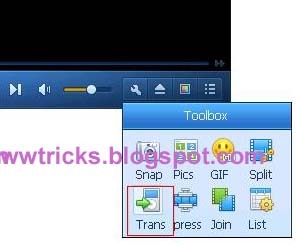 Here you can choose your converted format(3gp.avi.mp4 etc) and can change resulotion to your choice.You can also browse your converted file to the place you want to be save. Step-4:click on START to start converting. Now wait for and keep your eyes on the progress and time remaining. your video format is converting. Thanks for visiting, if any problem then feel free to leave your comments.